Daily Acts of Resistance: Trump Wants to Hike Entrance Fees to National Parks. Say NO! Trump Wants to Hike Entrance Fees to National Parks. Say NO! The latest outrage. Trump administration wants to increase entrance fees at our most popular national parks DRAMATICALLY. 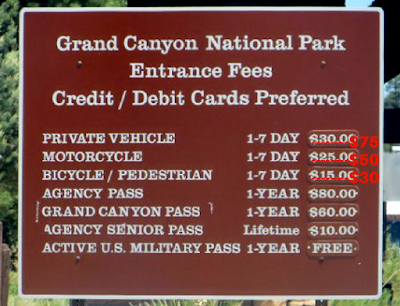 Entry at these parks currently costs $25 or $30 per vehicle, no matter the season. Under the new rates, entrance would cost $75 per vehicle during the five-month peak season. Per-person entry fees which are currently $10-$15 would rise to $30 during peak season. Submit a public comment now to say you're opposed to making it harder for anyone who is not wealthy to enjoy these national treasures that are owned by all of us and are supposed to be there for EVERYONE to enjoy. You can read the full fact sheet here. More on this from NPR. Click here to submit your comment. There's a sample comment below but I encourage you to use your own words. Please spread the word - the deadline to weigh in on this bad idea is November 28th. I urge you not to raise park entrance fees in this dramatic fashion as it will have the unfortunate effect of making it harder for working class and poor Americans to enjoy our national treasures which are owned equally by all of us, regardless of income level. 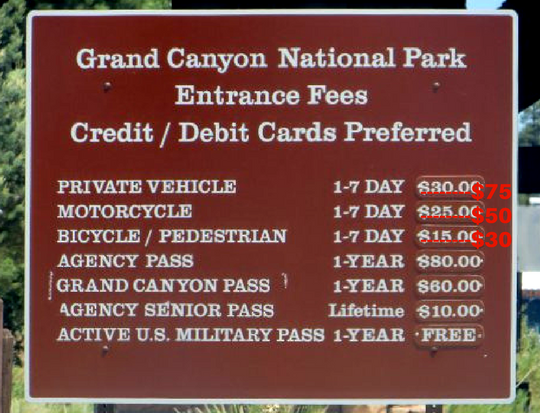 While I fully support efforts to fund the backlog needed for maintenance at our national parks, this is not a good way to get there as it will disproportionately hurt lower income Americans. Please reject this misguided plan.